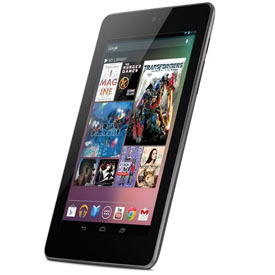 With new tablets hitting the market what seems like every week, Google's Nexus 7 device is still holding strong, selling about 1 million units a month, according to Asus, which produces the device. Asus CFO David Chang told The Wall Street Journal that the 7-inch tablet has grown from summer shipments of about 500,000 units per month, to 600,000-700,000 before approaching 1 million in October. Analysts had estimated that Google would sell between 800,000 and 1 million Nexus 7 tablets during the third quarter, the Journal said. The report comes shortly after Google unveiled a new Nexus lineup, including the 10-inch Nexus 10 and a Nexus 7 with expanded storage capacity and Android 4.2, as well as the Nexus 4 smartphone. The new LG phone boasts a 4.7-inch, 1,280-by-768 display, plus a 360-degree photo option, available via T-Mobile for $199. Samsung's larger Nexus 10 carries a 10-inch, 2,560-by-1,600 display, and a price tag of $399 for the 16GB or $499 for the 32GB. Additionally, the Nexus 7 got a storage boost, bumping the 8GB version out of the running, instead selling the 16GB for $199, and a new 32GB for $249. Check PCMag's review of the original Nexus 7. Still, nothing compares to the 14 million iPads Apple sold in its third quarter — a drop from the 17 million it sold in the previous quarter. Apple also unwrapped its iPad mini and fourth-generation iPad last week, and is already selling out of early shipments of both. For more, see PCMag's hands on with the iPad mini, as well as the iPad 4.